Soak the raisins in hot water for about 10-15 mins till it become plump and then drain the water. In a big mixing bowl, add the flour, brown sugar, 1 tsp salt , oil , cinnamon powder and raisin and mix well. Then add one beaten egg and the yeast mixture.Gradually add the milk and make a loosely packed dough.On a lightly floured surface, take the dough and knead it with your hands until the dough becomes soft and supple. Knead for about 5-6 mins. The dough should be soft but should not stick to your hands. Take a big bowl, add 1/2 tsp of oil and put the dough and make sure it is coated with oil so that it does not dry out. Cover it with a plastic wrap and let it sit at room temperature for about 2 hours, till the dough nearly doubles in size. Punch down the dough with your fist and knead for couple of mins. 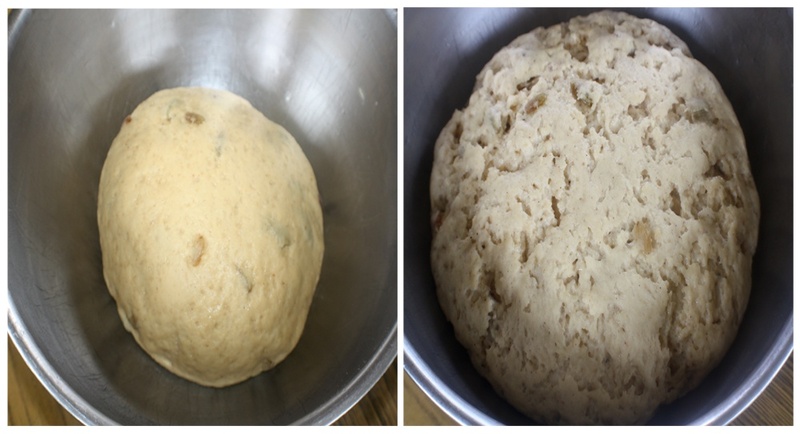 Divide the dough into halves. Then cut each half into 3 pieces and roll each piece into a long rope. 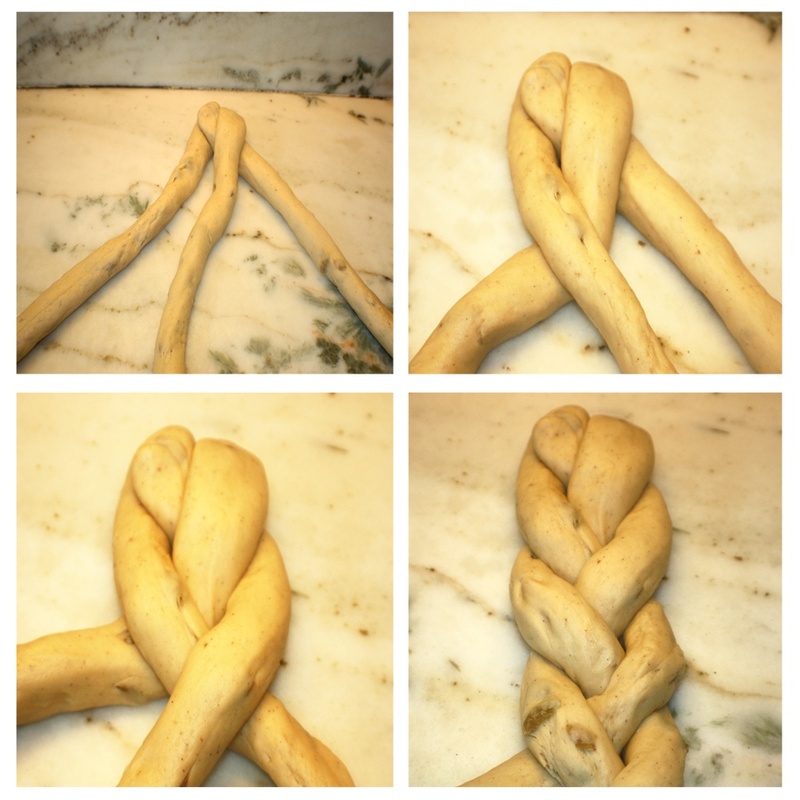 Braid together 3 ropes to form a braided loaf and tuck the end under. 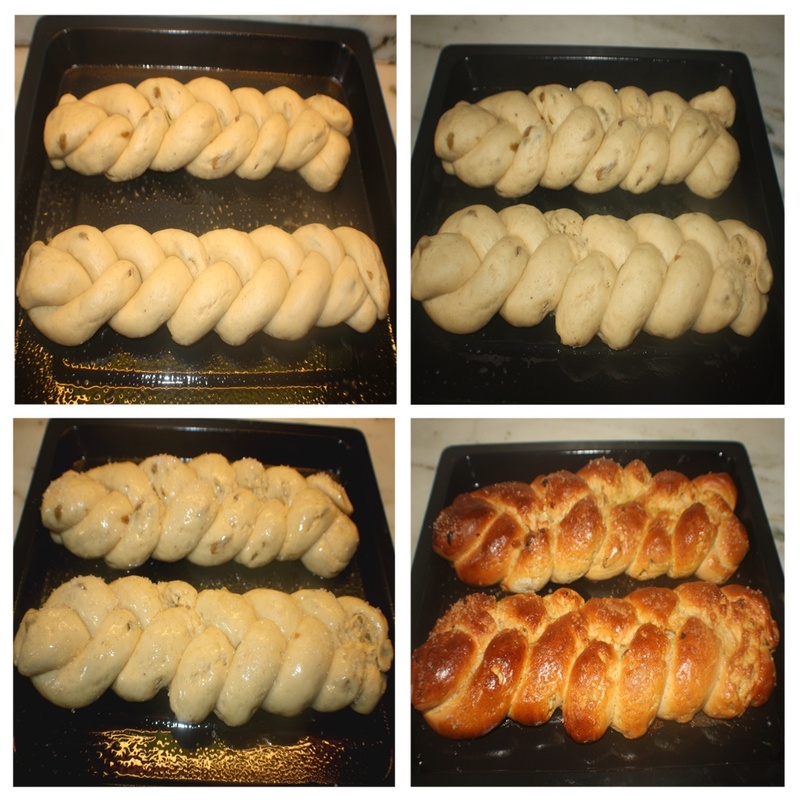 Transfer the braided loaves into a slightly greased baking tray. Arrange each loaf about 4 inches apart. Set it aside in a warm place for another 30-40 mins, for it to rise. Meanwhile, pre-heat the oven to 190 degrees Celsius. After the loaves have risen, brush the loaves with egg wash ( 1 egg beaten with a tbsp of water), sprinkle coarse sugar all over the loaves and bake in the middle rack of the oven for 40-45 mins until it is golden brown. Transfer to a rack to cool. Note : Bread can be made 2 days ahead and kept, wrapped well, at room temperature or frozen 1 month. 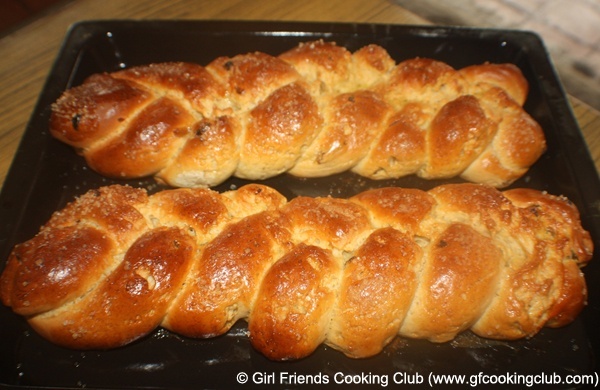 This entry was posted in All Recipes, Breads/Cakes/Rotis/Parathas and tagged Raisin Bread by Kamakshi. Bookmark the permalink.